Thank you with all my heart for that fine letter you wrote me on May eleventh. It has stimulated me and done me good to read it. I wish that I had time to send an adequate and worthy answer. 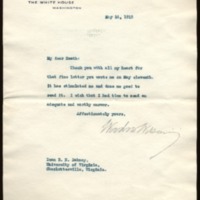 Wilson, Woodrow, 1856-1924, “Woodrow Wilson to Richard Heath Dabney,” 1915 May 14, WWP20505, University of Virginia Woodrow Wilson Letters, Woodrow Wilson Presidential Library & Museum, Staunton, Virginia.